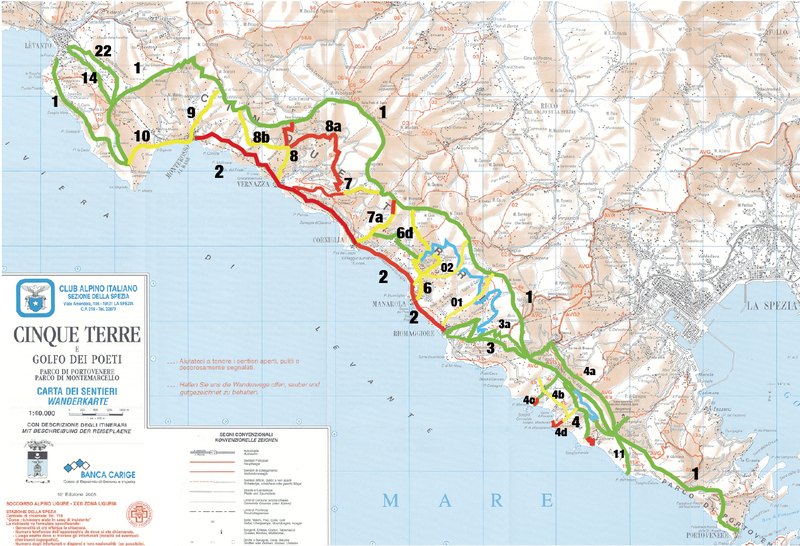 The Cinque Terre are crossed by a network of trails, coastal and interior. The path of the coast allows you to touch the five countries in five hours of walking, while the ridge of the Sanctuaries is more challenging. You can also walk the path of the shrines that leads to religious places of the five villages. The views that can be seen from many points of the trails are beautiful and very impressive, especially along the coast path. All the paths are of low or medium difficulty, but always be faced with a lot of attention, especially in the winter months. From Porto Venere, in Piazza Basteri, can be reached by car or bus line 11 or P, or with the ferry from La Spezia or Lerici. Best known track because highlighted by C.A.I. as connection between Porto Venere and Levanto. 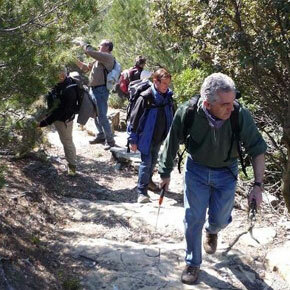 The first part is in the territory of the Regional National Park of Porto Venere. From Piazza Basteri, take the steps behind the Castle after a steep walk in the Mediterranean scrub at 200 m above sea level; at the Cava Canese crossroads (see variable 1). Continue going right, until the Mortea hamlet, where small buildings indicate the Muzzerone Refuge Here there is hospitality and refreshments. Passing the refuge, continue on the track, between areas of scrubland, to a winding curve on the paved road, descending to Sella Derbi. The track continues upward along sheer drops to the sea, crossing the area of Pitone (which in dialect means panoramic view), there are jagged spurs rich with rocky vegetation from which the magnificent view ranges from the islands of Palmaria, Tino and Tinetto to the coast of the Cinque Terre. Continue along the sea slope of Mount Castellana until you encounter the paved road. Having crossed it, set off on the track in the pine forest till you reach, after the sports ground, the village of Campiglia, where the tracks from the direction of the Gulf of La Spezia converge. Near Cava Canese continue straight ahead in a steep climb to the Fortress Muzzerone from where you can admire a fantastic view over the climbing area. From here you can descend along the curved paved road until you reach Sella Derbi in the creek of Le Grazie, from where there is a connection with the # 1 C.A.I. main trail. From Sella Derbi it is possible to follow the inward slope of Mount Castellana following the Alta Via del Golfo (AVG). From the Terrizzo hamlet, accessible by tourist boats from Porto Venere and La Spezia. Parts of the track feature different levels of difficulty. There are abrupt changes in altitude over a total height difference 198 meters and walkers are advised to be properly equipped. The track begins on a dirt road that smoothly climbs in altitude hugging the part of the island facing the Gulf of La Spezia, which allows us to admire the Fortress of Umberto I°, the Torre Scola and the numerous beaches of Cala della Fornace. An uphill deviation on the right of the track, leads to the ex telegraph station, in the Roccio locality, considered one of Liguria’s most beautiful terraced areas and surrounded in spring time by blossoming broom , red valerian but most of all home of the red rock roses (Cistus creticus subsp. eriocephalus (Viv.) Greuter & Burdet, ex Cistus incanus L) at the outer limit of its distribution area.Continuing along the hilly track that follows the island’s side towards south, through an area of Mediterranean scrub alternated with areas of scrubland and Holm forest, follow the steep descent which requires caution but allows you to reach the beach of Pozzale and the other dock of Palmaria (it is possible to return to Terrizzo or to Porto Venere by boat). A pleasant walk on the promenade connects the beaches with the nearby area distinguished by a Portoro Marble quarry, which in the recent past was a place of work and now is the undisputed kingdom of the herring gulls that nest there. Leaving behind the view of Tino Island, set out on the ascent through the wildest and barest part of the track that leads to the top of Palmaria at a height of 186 m above sea level. This route offers extraordinary scenic glimpses of the vast open sea and the cliffs, undisputed territory of the Porto Venere cornflower, exclusive species of the Protected Area. Once you reach the road, from where various alternative routes start, turn left towards the Center of Environmental Education (C.E.A.). Further on, you reach the dirt road from where the most complex trail of the island starts opposite the headland of Arpaia where the church of San Pietro of Porto Venere was built . Down at sea level an effortless route winds between beach and trail, with the perfume of sea and the caress of the wind, splashing waves and screeching gulls, bringing you back to the starting point in Terrizzo. Punta Mariella – track that leads to sea -At the Roccio hamlet, instead of continuing for Pozzale go down the trail towards the sea surrounded, in spring time, by blossoming broom, valerian and rock roses, reaching the crest below, a destination for bathers who love tranquility because it can only be reached by this trail or, from the sea or with a private boat. Road open to vehicles, not busy, from C.E.A to Terrizzo. An effortless walk of approximately 45 minutes, under the shade of majestic trees, typical of vegetation that has not suffered the consequences of human contamination. Convicts’ Road – track from C.E.A. to Terrizzo. From the road on the right a dirt road departs running alongside the moat edge of Forte Cavour, at the end of which you descend a trail with a series of bends and steps which allow the walker to admire views differing in altitude and prospective in an area rich with heady fragrances from aromatic plants (myrtle, rue, thyme, etc.). Canalone – shortcut from C.E.A. to Terrizzo – Descend the steps that lead to “Casa dell’Ammiraglio” recognizable from the monumental domestic pine tree, follow the road and after a couple of bends, take the track on the left which leads into the humid area of Palmaria allowing the walker to reach Terrizzo in approximately 20 minutes. It is a track which connects the village of Le Grazie with Portovenere, passing through the Mortea and the Martina area, so called to remind the story of a young lady which inspired a local legend. Ruins of Doria Castle in Portovenere, Italy along the Mediterranean Sea Coastline built by the Genoese wealthy Doria family. You will reach S.Caterina staircase and you can go down to Bastreri square where the pedestrian area of Porto Venere begins. Enjoy the visit of this town world heritage site. From the Napoleonic road between La Spezia and Porto Venere, at the bend before the Fezzano village cemetery, accessible by car or bus 11 or P.
The track allows the walker to observe considerably different environments over a short route. At the Fezzano bend, take the second set of steps on the right (Via Ruggeri becoming Via Alloria) to Via Simonetta Cattaneo, cross and proceed for about 50 m to the crossroads, on the left, to a recognizable trail marked by a large rock and a lamppost. This area is marked by uncultivated land and in rainy seasons it might be necessary to cross a small stream created by the Marsignano spring. The route, after passing the terraced olive groves, in the Carame area, continues in the shadows of the Holm forest, comes out in the dirt road that crosses the mixed forest that towers over the bay of Panigaglia up to the crossroad with the track that leads to Mount Castellana, in the area of Pezzino Alto. The road on the right brings us to Mount Castellana, the trail on the left leads to Sella Derbi and after a few meters connects into C.A.I. trail # 1. Before the track advances into the Holm forest an ascending junction leads to the twelve stations of the via Crucis of Croce del Giubileo, which is also visible at night from the road that connects La Spezia with Porto Venere due to the illuminations. Continuing on the ascending track on the right you follow the Alta Via del Golfo (AVG) towards La Spezia, instead of continuing on the dirt road to arrive at Sella Derbi and connecting to trail N.1.